I will visit the beach in Rhode Island any time of year, even to the point of dragging Drunk Tailor there in January (I really like water). But as the wind speeds rise and temperatures drop, I begin to dream of summer, and especially of summer meals. 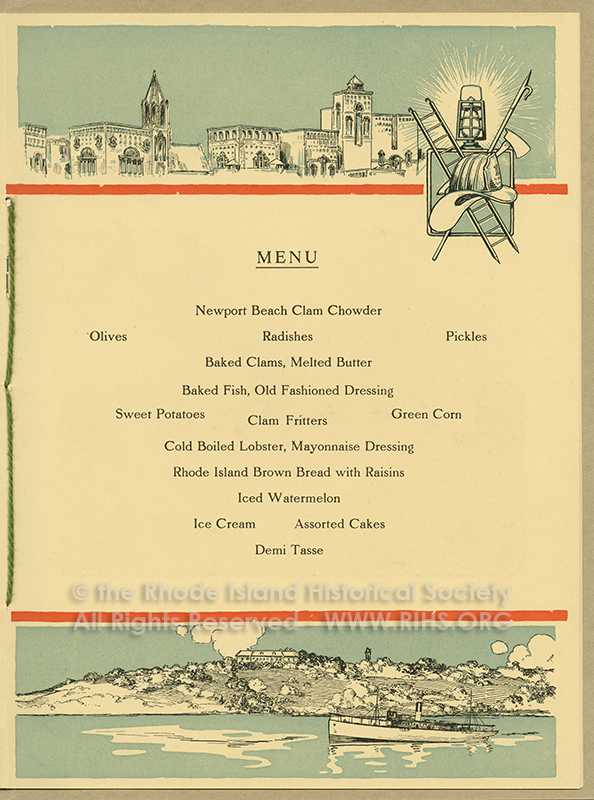 This 1916 Clambake program and menu is in the RIHS Graphic’s Ephemera Collection, and while not quite Wiener Werkstatte quality, the dramatic graphic style captures the zeitgeist of the early twentieth century. Inside, the menu captures the flavors of late summer New England, from the Baked Clams with melted butter to Green Corn, cold Boiled Lobster and Iced Watermelon for dessert. It’s time to start planning Christmas menus (I finally caved and brought in a tree, much to the delight of the feral cat), and fish is always on the list. Our tradition has evolved from the Christmas Eve bouillabaisse of my childhood through salmon with dill to a New York Times fishmonger’s stew. I certainly have the tureen for such a production, but the capacity is large, and with only three adults to eat the stew, I wonder at the sense of making up such quantities. Quonochontaug Clam Bake Can ca. 1970. RIHS Museum Collection. I could assemble a clambake for home, and boil it up on the stove in Don Draper’s 1962 kitchen– that’s a more recent tradition than the sand-pit variety– but it seems slightly mad, as all (potentially) good ideas can seem. It’d be July at Christmas, and although I’d miss the smell of the ocean, the cry of the seagulls, and the warmth of the sun on a late summer afternoon, it might be worth the effort. I shall be traveling home to my lovely Rhode Island for the holidays…I too am happy to go to the beach any time of the year! Perhaps I’ll see you at the dunes.